In order to safeguard the purchase price we negotiated and obtained against speculative gains and to ensure our work on the ExRotaprint project, we decided to form a heritable building right with the trias and Edith Maryon foundations. The ninety-nine-year heritable building right contract was signed with the foundations on September 3, 2007 and runs through 2106. Both foundations work with property in a novel way and are therefore ideal partners for our project development where financial profit is not the goal. With the heritable building right, ExRotaprint gGmbH occupies a position equal to ownership for the entire length of the contract. We are responsible for all aspects of the project’s development and financing. Only the selling of the complex is excluded. We involved the foundations in the purchase contract that we negotiated with the Liegenschaftsfonds Berlin. On the day the site was purchased, the foundations passed the complex onto ExRotaprint gGmbH by means of the heritable building right. The heritable building right divides up ownership; the buildings are the property of ExRotaprint gGmbH, the foundations retain ownership of the land. For the use of the land, ExRotaprint pays an annual ground rent equal to 10% of net rental income exclusive of heating and other costs (or a minimum of at least 5.5% of the land’s total value). The annual ground rent—which will greatly exceed the purchase price over the long-term—allows the foundations to invest in new projects. 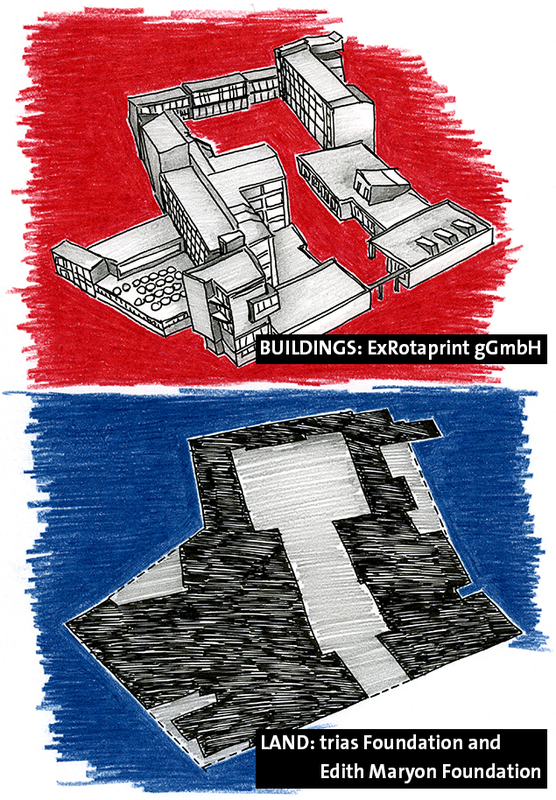 In forming the heritable building right, ExRotaprint specifically decided to participate in this form of capital flow solidarity. 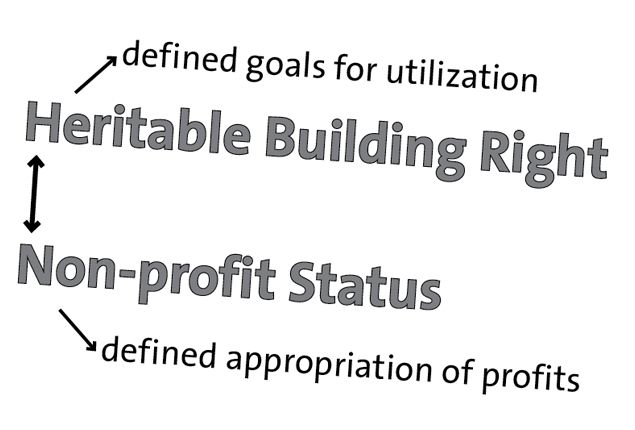 Our objectives—renting space to commercial businesses, cultural uses, and community outreach programs (work, art, and community) in equal proportions, the socially integrative orientation of the project, and its nonprofit status—are formalized in the heritable building right contract. This safeguards ExRotaprint for the longterm and also allows it to pursue in the years ahead a form of property development not based on financial profit but on benefitting a heterogeneous user base. The legal instrument of the heritable building right makes sustainable property management possible by defining the long-term objectives for development and use and guaranteeing an annual interest payment. Heritable building right contracts open up possibilities for both contracting parties to impact the scope and direction of social and city politics without relinquishing forever the space needed to shape discourse or excluding those segments of the population with fewer financial means from access to space and its uses. The heritable building right was introduced in Germany in 1919 with the Heritable Building Right Law in order to promote residential construction and to enable lower-income populations to build homes. At the same time, the idea was to create an instrument for opposing property speculation. The heritable building right divides up ownership of property by separating the parcel of land from the buildings. The party providing the heritable building right owns the land; the party receiving the heritable building right owns the buildings. A heritable building right is equivalent to ownership with all the associated rights and obligations related to property management. With a heritable building right contract, the landowner leases the parcel of land to the recipient of the heritable building right for an agreed period of time. In the heritable building right, the aims and objectives can be specified for types of use, what purposes the management serves, or the scope of the construction. These objectives apply for the duration of the heritable building right and are therefore essential aspects of the contract. As a rule, a heritable building right is valid for ninety-nine years. Shorter contracts are possible; contracts spanning less than thirty years are not advisable in view of the investment costs borne by the heritable building right recipient. In return, the heritable building right provider is paid an annual ground rent that is based on the value of the parcel of land and which is freely negotiable. Depending on the type of use and the aims and objectives, it is usually set at 3 to 6.5% per annum. The ground rent is designed to preserve its value, i.e. it is subject to adjustments that typically tie it to the consumer price index. The ground rent can also be tied to property management yields and a certain percentage of the earnings. If a building is located on the parcel of land at the time the contract is signed, its value is determined separately from the land and purchased by the heritable building right recipient either outright, in installments, or in accordance with another arrangement. However, it is also possible to factor in the value of the building when calculating the ground rent. If the building is in dire need of renovation, has inherited liabilities (e.g. asbestos or other contaminants) or other restrictions (e.g. monument protection), the building value can be very low. All investment costs, whether new construction or renovation, are borne by the heritable building right recipient. The heritable building right holds first-rank priority in the property owner’s land register. A separate land register for the heritable building right is created and maintained. The value of the heritable building right is often higher than the property encumbered with the heritable building right, since the heritable building right recipient makes earnings from managing the property. A loan can be taken out based on the value of the heritable building right in order to invest in building renovations or the construction of new buildings. In general, the upper limit of the loan amount is specified in the heritable building right contract and requires the approval of the heritable building right provider. Debts must be repaid before the heritable building right expires. In order to guarantee proper management of the property for the entire length of the contract, the precise steps for paying off the value of the buildings upon retransfer must be specified, since otherwise no investments would be made during the final phase. If the heritable building right provider does not wish to use the property for other purposes, an extension of the heritable building right may then be negotiated at any time. A premature termination of the contract can only be effected by the insolvency of one of the two contracting parties, a failure to pay ground rent, or a violation of the aims and objectives. In these cases, rules are formulated in the contract for mutual pre-emptive rights, sanctions in case of breaches of contract, and detailed rules in the event the heritable building right is terminated. Building value is determined when the heritable building right ends (known as “reversion”), which must be activated—at least in part—by the heritable building right provider. The exact terms of compensation paid to the heritable building right recipient when ownership of the buildings is reverted back are specified in the heritable building right contract. Heritable building rights can be inherited, sold, or divided up. The consent of the heritable building right provider is required for a sale or to divide the right, insofar as this is stipulated in the hereditary building right contract. The heritable building right divides up ownership. The buildings are the property of ExRotaprint gGmbH, the foundations retain ownership of the land. For the use of the land, ExRotaprint pays an annual ground rent equal to 10% of net rental income exclusive of heating and other costs or a minimum of at least 5.5% of the land’s total value. Stiftung trias—Land is not a commodity produced by the individual, it therefore does not have the character of a commodity. Land is finite. It is a legacy of mankind that has been handed down for careful stewardship for future generations. Each of us needs land; it must therefore be accessible to all people. Individuals are also beneficiaries. Increases in value resulting from a society’s overall development are not owed to the individual but to society as a whole. Stiftung Edith Maryon—Real estate is a social commodity. Land resources are finite and the question of how they are used is a social issue. Moreover, buildings inevitably have an impact on society, on public space—potentially for the duration of several generations. This is where the work of Stiftung Edith Maryon begins. The mission of the nonprofit foundation is to work with owners and users to remove property from the flow of commerce and inheritance so that it is no longer subject to speculation but is instead made available, permanently but flexibly, for new projects that serve society.